The Recorded History Of Quakes Is A Long One The devastatingly destructive earthquake in Japan is being called the largest in the country's recorded history. The Japanese have been keeping records of seismic aberrations for centuries. But with scientific and technological advances, the nature of what it means to record history is changing. 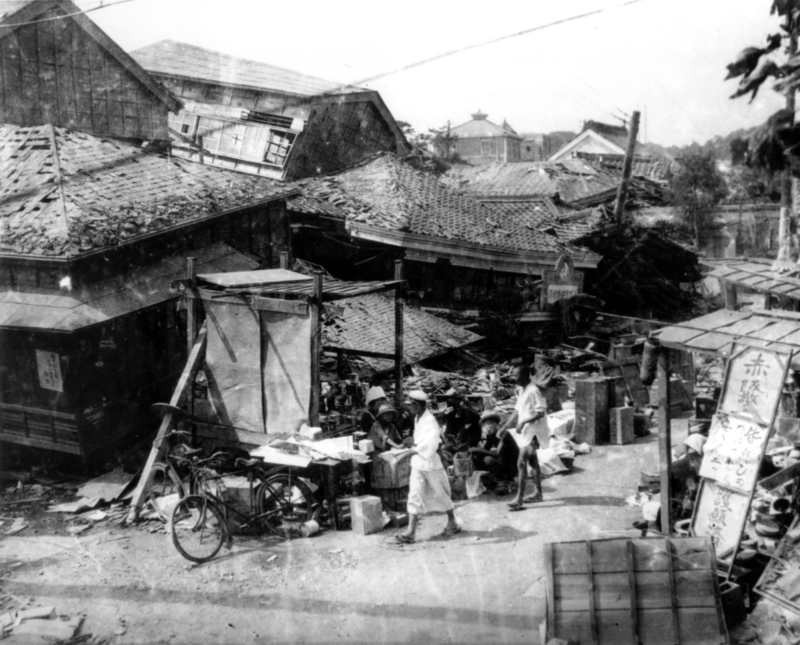 A 1923 earthquake leveled much of Tokyo and Yokohama, Japan, killing more than 140,000 people. The devastatingly destructive earthquake in Japan is being called the largest in the country's "recorded history." The phrase "recorded history" carries meaning because we humans are a chronicling race. And somehow knowing where an event falls on a timeline and how devastating it is gives us the coordinates of our catastrophe. If the cataclysm can be fixed in time and in space, maybe it helps us wrap our minds around it. In the same way we use various measurements to determine the severity of the earthquake, we also use magnitude and intensity — with an internal seismograph — to measure the impact of this monstrous moment. Precisely when "recorded history" starts, says Jonathan Shulman, president of the California World History Association, "depends entirely on what region of the world you're looking at." Citing A History of Writing in Japan by Christopher Seeley, Shulman says that Japanese recorded history "starts" in the first or second century "when the idea made its way from China during the Han Dynasty." Before long, the first recorded Japanese earthquake appeared in the country's literature. In 1905, the British magazine Nature reported on an address titled "Recent Seismological Investigations in Japan," delivered at an exposition by Baron Dairoku Kikuchi. A former minister of education in Japan, Kikuchi said that the first earthquake in Japan's recorded history occurred in 416. The bulk of Kikuchi's address explained his country's then-contemporary geologic investigations. And it gives us a glimpse, more than a century later, into the historical recording of modern earthquake measurement in Japan. Paraphrasing Kikuchi's address, the 1905 Nature report refers to a collection of statistics, compiled by members of the Tokyo Earthquake Investigation Committee. The report states that up to that moment there had been a total of 47 "destructive earthquakes that originated beneath the Pacific." Of that number, 23 "were accompanied by tsunamis, or sea waves, which probably means that on these occasions marked and sudden changes had taken place in the configuration of the sea bed." This report is a far cry from today's detail-filled explanation of the March 11 earthquake — with a preliminary magnitude 8.9 — near the east coast of Honshu, Japan. The seismic event, according to the U.S. Geological Survey, "occurred as a result of thrust faulting on or near the subduction zone interface plate boundary between the Pacific and North America plates." The Japanese have been keeping records of seismic aberrations for centuries. And some of the earliest uses of the seismograph — the instrument that led to today's ways of measurement — were developed there. But according to a paper written for the U.S. Geological Survey in 1969 by James Dewey and Perry Byerly much of the credit for realizing the seismograph's value goes to a group of British professors who were teaching at the Imperial College of Engineering in Tokyo in the late 1800s. "These scientists obtained the first known records of ground motion as a function of time," Dewey and Byerly observed. "Furthermore, they knew what such records could reveal about the nature of earthquake motion. They used their instruments to study the propagation of seismic waves, and they used them to study, for engineering purposes, the behavior of the ground in earthquakes." In the aftermath of a major earthquake in Yokohama in the spring of 1880, John Milne, one of the Brits, helped create the Seismological Society of Japan. "The society was the first devoted to seismology," Dewey and Byerly write, "and its founding marked the beginning of a period of rapid growth of seismology in Japan." Over the next 20 years, they wrote, Milne helped establish seismographs at measuring stations around the world, in hopes that the information could be evaluated and compared at a central laboratory. And he and other visiting professors experimented with various measuring devices — using pendulums and levers and spiral springs and reservoirs of mercury, among other things — in the hopes of improving the "recorded history" of earthquakes. Today the dream of shared data is closer to coming true. Earthquakes are recorded for history by a vast seismographic network. According to the USGS, each of the stations in the network measures the movement of the earth at a particular location — in terms of magnitude and intensity — then uses that information to infer movement at the epicenter of the quake. The magnitude is the measure of the "size" of the quake. The intensity of an earthquake is determined by the amount of damage it causes at a specific observation point. Building on the methods of scientists from around the world, today's researchers are able to establish and measure earthquakes and their damage in more precise detail for the generations that follow. But leave it to contemporary times to complicate the issue. "The term 'recorded history,' " says Jonathan Shulman, "used to have much more weight prior to the 20th century, when the study of artifacts was limited to reading old texts, carvings, etc." With carbon dating and other similar techniques, he says, "the doors have swung wide open. While we may be 100 years further into the future and further from the past than we were in 1911, we are in fact much, much closer in our understanding of what happened hundreds and thousands of years ago."